Coconut oil is made from extracting the natural oils present in mature coconut meat. Commonly used in Latin America and Southeast Asia, coconut oil can be either refined or unrefined, and it can be used for everyday cooking, including frying. Different coconut oils tolerate high temperatures better, so if you are frying with coconut oil, choose refined coconut oil. The smoking point of an oil is how high a temperature it can reach before the natural impurities in the oil begin to burn. The lower the smoking point, the lower the temperature the oil can be heated to before it starts smoking as a result of burning impurities. Higher smoke-point oils are better for high-temperature cooking, including deep frying. While refined coconut oil has a smoke point of 400 degrees Fahrenheit, unrefined coconut oil only has a smoke point of 350 degrees. Coconut oil is made from dried coconut meat, called copra. Refined coconut oil has been filtered and bleached to remove any scent and impurities. It also has additives to reduce fatty-acid content and increase its shelf life. While you can refine coconut oil mechanically, it is more commonly done chemically. Unlike refined coconut oils, unrefined coconut oil, also called "virgin" coconut oil, is simply expeller-pressed. In some cases, virgin coconut oil can be made from fresh rather than dried coconut oil, and while it contains more impurities, it also preserves more of the healthy fatty acids. Coconut oil is rich in medium-chain triglycerides, which are made up of healthy fatty acids. These fatty acids are mostly lost during the refining process, but they are present in unrefined coconut oil. This means that the fat content of unrefined coconut oil may prove beneficial. 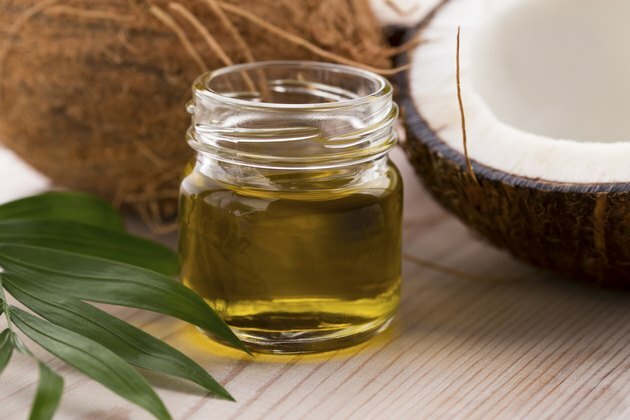 A 2008 issue of the "American Journal of Nutrition" contained a study that found that a diet high in medium-chain triglyceride rich oils, like coconut oil, helps improve overall body-weight levels and increased fat loss when compared to olive oil. Researchers concluded that because of the strong weight- and fat-loss benefits of medium-chain triglyceride oils, even a small change in oil intake could be helpful with increasing weight loss.